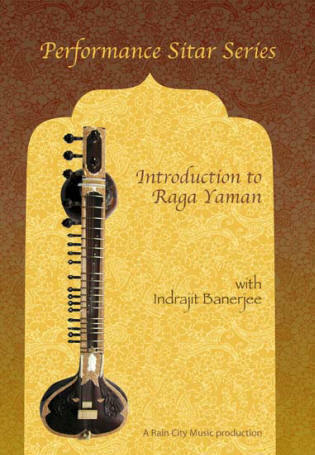 This unique DVD by Indrajit Banerjee is the first offering from Rain City Music in this series. The artist interactively familiarizes the viewer with the basic movements of a Raga performance such as alap, jor, gat, taan, and jhala, as well as exercises for practice and different sitar techniques. There are several lessons worth of knowledge at a pace conducive to learning. The teaching is done in a repetitive style with vocal illustrations, and is easy to follow. Raga Yaman is the primary raga of the Kalyan thaat and is an excellent raag for a student to learn initially. It has all natural (shuddh) notes with the exception of MA which is sharp (tivra). This evening raga evokes a mood of devotion and tranquility, and is well suited for sitar. This presentation by Rain City Music is intended for students who possess basic knowledge of sitar and is an invaluable learning aid. The teaching style is traditional with Tabla accompaniment by Rajeev Chakraborty. Professional filmed and edited NTSC format. I received the dvd and have to tell you that IT WAS ONE OF THE BEST INSTRUCTIONAL VIDEOS I HAVE EVER SEEN !!! HOW AWESOME IS IT !!! Why dont you guys do similar ones for rags TILAK KAMOD, SHUDDH KALYAN and any other really popular light ragas by the same artist? just wanted to folllow up re below and also let you know that I received the shipment and everything was great. THanks for the calendar and agar bathi. I can't say how much I enjoyed the Introduction to Yaman. It is far and away the best video lesson for sitar that I have seen. I am really excited about your next project along the same lines. There are so many areas that could be covered and I think Indrajit is a terrific teacher- it reminds me a lot of the lessons I used to take with Amit Adiecha and also with Amit Chatterjee later. The DVD arrived yesterday in perfect condition, really fast delivery! I allready had a great time watching it, the general impression from this first day is: very, very good, in musical dimensions but also in terms of photography/ camerawork! I think this DVD is really equally worthy for starters and more experienced Sitarists/ ICM musicians. Allthough I´ve worked intensively some time now on Rag Yaman, including a lot of listening to as many different interpretations of this beautifull Rag, especially in the Dhrupad genre, I will be able to learn a lot from this DVD! Also great compliments to Mr. Banerjee for his warm and empathic way of explaining, demonstrating and playing. So let me thak you very much again, I look forward for the next DVD´s to come. I´ll be among the first ones to order them! All the best, the "old European"
I have to give a shout out to Lars for the production of this first in a series DVD. I have been going through it (Yaman) and have to say how surprised I am that one can learn, actually learn so much from this type of format. Indrajit is a wonderful teacher. He sings in sargam, then plays. Highly recommended if you have no teacher near-by (and even if you do!) There's no holding back information. There is so much good stuff here that you'll be busy for months. Lars says at least 10 lessons worth. I say double that. Good stuff. Way to go Lars. "As a student, I can say this is the type of training one would receive from Indrajit in a one-on-one environment. Even though this is not an introduction to sitar, he uses basic and advanced playing techniques to show how to play a nice version of Yaman. You are taken from alap and jor through two gats and jhalla. He uses sargam-singing, bol-baz and strokes throughout. There is enough material here to keep an intermediate student busy for at least several months. The only recommendation is to use a lapel microphone instead of hand-held, but I understand that is already planned for in future releases. In short, I recommend it as a valuable training aid." The DVD is a superb learning material,I am very happy with it. Especially for beginners, like in my case, I started studying the sitar 3 months ago,I am 50 now and never is late to begin. With your DVD I know I have made a giant step towards understanding hindustani music. Please keep me informed of the new releases to come.